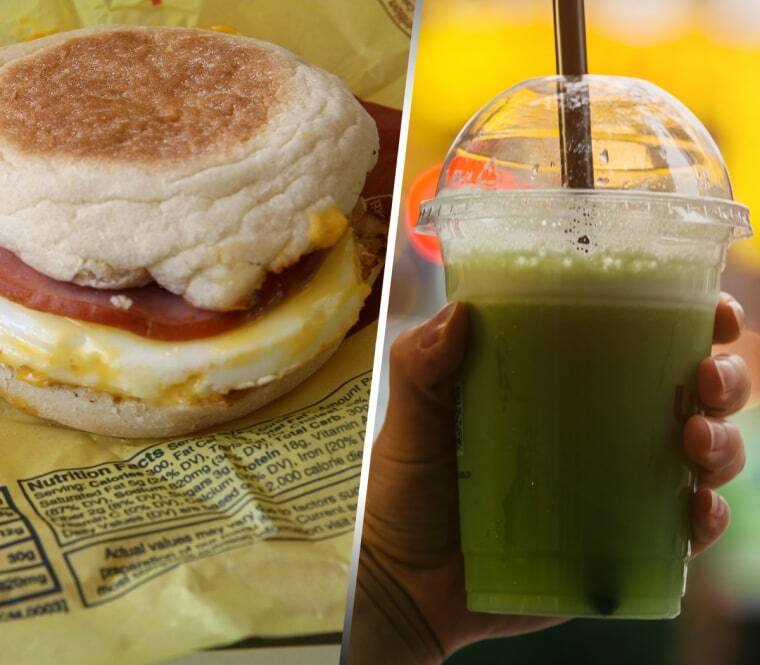 An Egg McMuffin or green juice? A smoothie or a latte? A nutritionist schools us on how to make the better choice. We all have a general sense of what the best diet choices are (even if we’re guilty of not always making them). Water over soda. Vegetables over chips. Lean protein over red meat. But in our hectic day-to-day lives it’s inevitable that we run into some situations where it’s not quite so black and white. While there may not be a best decision at our disposal, equipped with the right knowledge, we can make a slightly better one until we can get back on track. For those situations where there is a bit of grey area, we tapped Madelyn Fernstrom, Ph.D., CNS, health and nutrition editor for NBC News and the Today show, to school us on what the better decision actually is. It’s time to put your knowledge to the test. How well can you navigate these common nutritional dilemmas? You're running late for work: Is grabbing a donut at the morning meeting better or worse than eating nothing at all? Why: “This may be a surprise. Some people would think having nothing is better, but try not to skip breakfast,” says Fernstrom. “The problem with skipping food in the morning is it usually makes you over-hungry for lunch and you overeat. The best approach is to eat a modest meal (around 200 calories) within 3 hours of waking up.” Plus, you’ve been fasting overnight, so if you’re running on an empty stomach your energy levels may be low, she adds. A donut weighs in at about around 300 calories. Yes, it has sugar. But it has sugar and fat, which Fernstrom says allows the sugar to be absorbed more slowly. “And a donut is not the worst thing to choose: You might be surprised to know that a donut has fewer calories and less sugar than a low-fat blueberry muffin,” says Fernstrom, adding that if you do grab a donut or a muffin, wash it down with a latte for added protein. One caveat: If you’re not hungry, don’t force yourself to eat. “For healthy people, our bodies are really great at keeping blood-sugar levels stable. Skipping breakfast generally won’t impact blood sugar for most people — we are metabolically built to sustain variations in food intake,” says Fernstrom. So, if you aren’t hungry don’t grab any food in front of you just to have it. “It’s better to wait and eat when you’re hungry. Be mindful and see how you feel, that’s the best guide of all” she adds. You're making an omelet: Is using whole eggs better or worse than using egg whites? Why: “It’s better to use that whole egg. It’s not bad to use the white, but here’s the news flash: for health, eggs are back. It used to be ‘eggs are bad, they have a lot of cholesterol and will raise your blood cholesterol’ and that turns out not to be exactly true," says Fernstrom. "The yolk is filled with a lot of nutrients including vitamin D and protein, it does have a little saturated fat and cholesterol, but it’s not the bad food that we’ve been taught for so many years. So enjoy a couple of whole eggs.” If you don’t like whole eggs or don’t tolerate them well, opting for just the whites is fine, she adds, but if you’re a fan of the yolk there’s no need to toss them out! Is grabbing a green juice a better or worse breakfast than an Egg McMuffin? Is bulletproof coffee better or worse than regular coffee? It's 3 p.m. and your energy is dipping: Is a smoothie a better or worse option than a latte? You're at happy hour with co-workers and they order loaded nachos: Is having some nachos better or worse than drinking on an empty stomach? You're at Sunday brunch: Is avocado toast a better or worse choice than a western omelet? Is sweetening your tea with honey better or worse than using table sugar? Why: “These are both equivalent forms of sweeteners. They both have 16 calories in a teaspoon. Whether it is white sugar, brown sugar, honey, molasses ... some things ‘sound’ healthier and have a health halo, but they are all sugar,” says Fernstrom. “The way your body sees it is all the same way: It’s sugar entering your system. So if you feel better about having some honey, or like the difference in taste, it’s all the same calories.” What does matter is the amount you are using. “Even national guidelines say limit, not eliminate, added sugars. And for this, you need to read labels. ‘Taste’ is not an accurate guideline,” she says. “Aim for up to 10 teaspoons of added sugar per day. Do the math: If you’re using 3 teaspoons of honey in a cup of tea, multiple times a day, you’re already over!” Fernstrom encourages us to work on taming our sweet tooth, “which is a process, when you’re accustomed to super-sweet tasting foods.” The good news? “You can down-regulate your sweet preference. Start with adding half the amount of sugar in any beverage you choose and keep trimming until you’re at just one teaspoon per serving,” she says.